Smooth power transitions across the optical centre. Smooth progression zones helping to support easy adaptation. For your patients, silicone hydrogel means whiter eyes and a healthy2 lens-wearing experience. The clariti® 1 day lens allows 100% corneal oxygen consumption3. In fact, it provides more than the recommended amount of oxygen4 across the entire lens surface to help maintain ocular health. And for your practice, clariti® 1 day multifocal lets you expand what you have to offer with a lens you can prescribe with confidence. 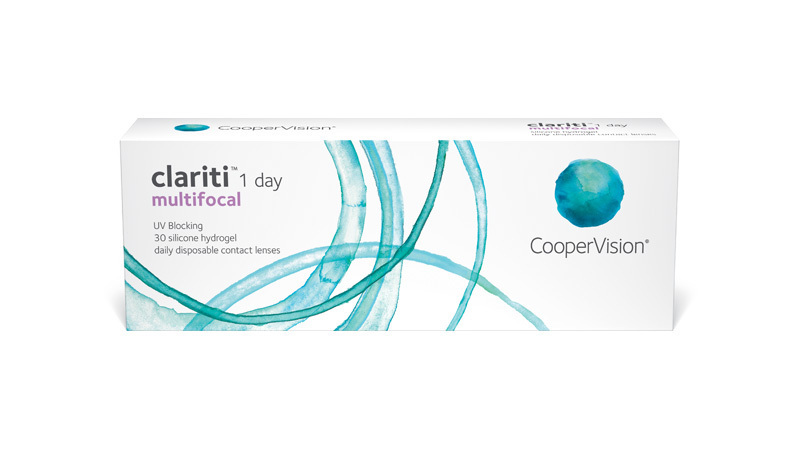 CooperVision clariti® 1 day multifocal features WetLoc™ technology, a process that creates a hydrophilic lens with optimal wettability. WetLoc is a non-surface treatment technology that manipulates the structure of hydrophobic silicone molecules so they become hydrophilic. This creates a lens that naturally attracts and binds water molecules, holding them tightly to the lens surface. WetLoc also provides continuous wettability throughout the wearing time. The result is a lens with high water content5 that provides excellent all-day comfort for your patients. Talk to your patients about the healthy advantages and daily convenience of clariti 1 day multifocal. Click here to see our clariti® 1 day multifocal fitting guide. Click here for more information on fitting CooperVision multifocal products. (5)Manufacturer’s quoted core water content.